Party Hostel, cheap and basic accommodation, close to shopping, restaurants and nightlife area, 2 blocks from Uffizi Gallery. Friday and Saturday - sangria party ...free!!!! The Hostel is situated in the heart of the city that helps you to save your transport expenses (5€ per day ). The Hostel has attitude, funky decor and homey atmosphere . We have a complete kitchen. We cater for all travellers and visitors from outside the Florence. Our hostel is in a safe neighborhood , convenient to affordable local shopping and restaurants and nightlife area, Two blocks from Uffizi Gallery. Our multi-cultural staff, who speak English, Spanish, French and Italian fluentlyat, is at your complete disposal for tour & museums bookings, tourist information or any other necessary information that can help make your stay in Florence more pleasant. The staff at the Euro student home work hard to make your hostel experience the best, and we will do everything that we can to make your stay in Florence fun and memorable. Located in the center of the city, without any bunk beds! Everything Is In Walking Distance ! 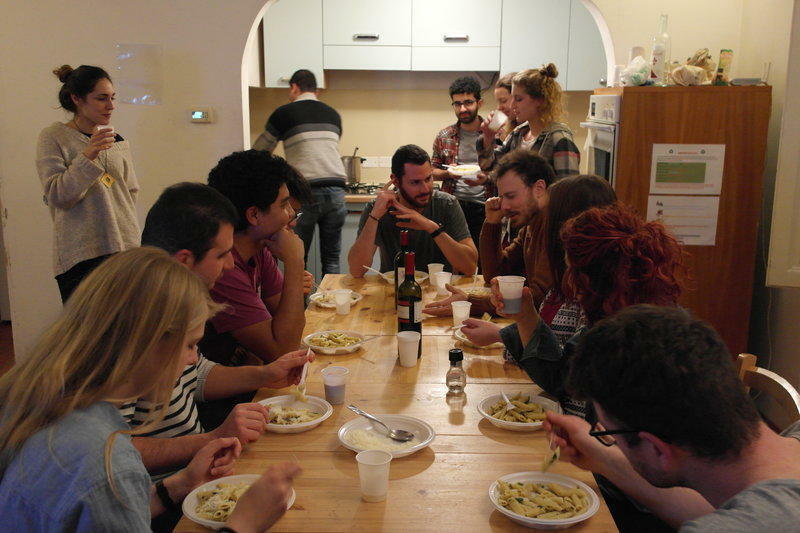 This hostel is excellent for meeting other travelers and for having a fun and comfortable time in Florence. The young and energetic staff will direct you to free entrances to all the clubs. Please respect your arrival time and note that we have a 48 hour cancellation policy. In case of no-show will charge the first night. Check out the photos of the hostel on the right side, just click on the thumbnails. age restrictions, under 18 must be accompanied by adult. max age is 40 years old. From the central station of Santa Maria Novella, exit right and continue down Via Panzani (the Piazza dell'Unit d'Italia will be on your left). Continue along Via Panzani, in the direction of the cathedral, il Duomo. Go right to Piazza della Repubblica and after 1 block turn on the right in Via Porta Rossa and ask for Via Pellicceria .n.1 (please pay ATTENTION: in florence we have double numbers you just have to see the ones in black or blue color) , and YOUR ROOM IS IN THE HEART OF THE CITY AND HISTORICLE CENTER OF FLORENCE. In case you prefer a Taxi, you will find the taxis stationed outside the railway station. There is a bus every half hour that leaves from Florence airport to Florence station. They start to go at 6am and the last one 11:30pm.